Dorothy Dent Park (center), then-president of the Park Foundation Board of Trustees, attends the 2006 opening of the Dorothy and Roy Park Alumni Center. 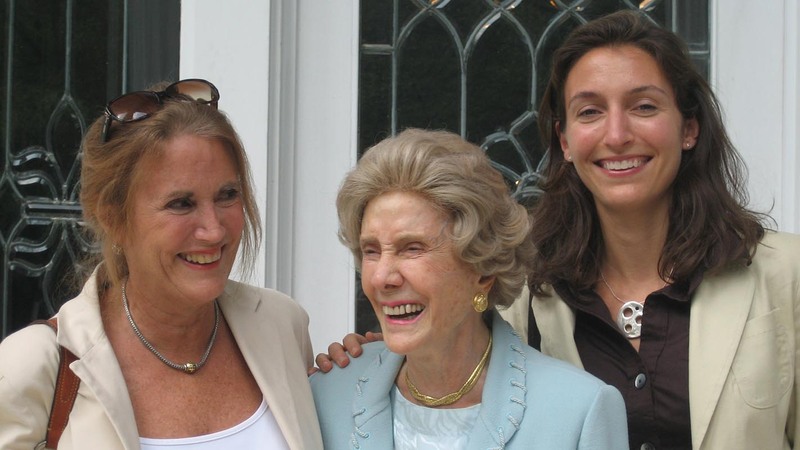 Pictured with her are her daughter, Adelaide Park Gomer (left), and granddaughter Alicia Park Wittink (right), also Park Foundation trustees. 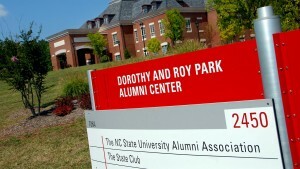 Dorothy Dent Park, president emeritus of the charitable Park Foundation—which has committed nearly $140 million to NC State—and the widow of NC State alumnus Roy H. Park, Sr. ’31, has died at the age of 103. Her legacy includes the prestigious Park Scholarships, which to date have invested in more than 1,000 remarkable NC State students, as well as a major gift to help construct the Dorothy and Roy Park Alumni Center, home of the NC State Alumni Association. Roy and Dorothy Park established the Park Foundation in 1966 to support education and charitable grant-making. When Roy Park died at the helm of Park Communications in 1993, Dorothy Park sold the company and dedicated the proceeds to the foundation. With her as president, the Park Foundation began major philanthropic efforts to support the academic institutions with which her husband had been affiliated, including his beloved NC State. In 1996, an initial grant funded 25 Park Scholars, the Class of 2000. Dorothy Park and the trustees of the Park Foundation established the Park Scholarships to bring exceptional students to NC State on the basis of outstanding accomplishments and potential in scholarship, leadership, service and character. Today, 165 Park Scholars are on campus, and they make this vision a reality. The Parks were deeply engaged with NC State over many decades, including Roy Park’s service as an NC State Trustee, his delivery of the 1978 spring commencement address, and his efforts as president and chairman of the board of directors of the Alumni Association. With words, actions, and gifts, they valued the role of private giving in education; Roy Park chaired the NC State Development Council from 1962-1966, and the Parks initiated the NC State’s Chancellor’s Circle of donors with the first contribution of $1,000 in 1961. “My husband and I always believed that the college years are just the beginning of university involvement,” Dorothy Park said. This belief led her to make a pledge to the Alumni Association Campaign for Excellence in 2004. After learning that construction could not begin on NC State’s new alumni building until an additional $5 million in funding was raised, Dorothy Park sent the university a personal check covering the amount needed. The Alumni Association named the Dorothy and Roy Park Alumni Center in honor of the gift. The Park Alumni Center on Centennial Campus. In 2013, the Park Foundation made an extraordinary commitment of $50 million, the largest single gift in NC State’s history, to plant the seed of an endowment for the Park Scholarships. From this incredible beginning, others are now making gifts of their own, safeguarding the future of these life-changing scholarships. One of the nation’s premiere merit-based scholarships, the Park Scholarships program affords students tremendous opportunity to grow academically, professionally and personally. Dorothy Park and the Park Foundation Trustees set a vision for scholars who would not only excel academically and as leaders, but would have the heart to use those abilities for the broader good. The Park Scholars have brought that dream to life, garnering wide recognition in all of these realms. They are responsible for both Service Raleigh—the largest student-run service endeavor in the Triangle area with about 2,000 volunteers annually—and the Krispy Kreme Challenge—a running and doughnut-eating event that attracts about 7,000 participants to Raleigh each year and has committed $2 million to the North Carolina Children’s Hospital. Their application of their knowledge and talents to make a positive impact has received well-deserved accolades. This year alone, several Park Scholars and alumni received distinguished national academic awards, including the Churchill, Goldwater, and Hollings scholarships; National Science Foundation Graduate Research Fellowships; and Presidential Early Career Awards for Scientists and Engineers. The NC State community is invited to share condolences and statements of the impact of Dorothy Park’s philanthropy in the comments section below this story. Comments will be compiled and shared with the family. My deepest condolences for the Park family, I was so sad to hear of Mrs. Park’s passing. Her life-long dedication to service and commitment to make change are passed along to each of the Park Scholars, and it was my honor to meet her many years ago. Through the Park program I learned how to transform scholarship to meet new world needs and the deep value of simple service simply given. I think of the the Park program the Mr and Mrs Park often in my daily work as a scientist and engineer throughout the developing world, I know that I would not be on this path without them. As they say here in Uganda, poleni sana, my deepest sympathies. My son, Tyrone Keys, from Tampa, FL was a recipient of the Park Scholarship Class of 2010. It provided a superior educational opportunity for him. His collegiate experience was superb. His sophomore class went to Washington DC where they met with one of our Supreme Court justices. The Park program impacted his life beyond words as he nows works as an engineering consultant and continues to serve his community. Thank you Mrs. Parks for your blessing. Our thoughts are with you and your family. 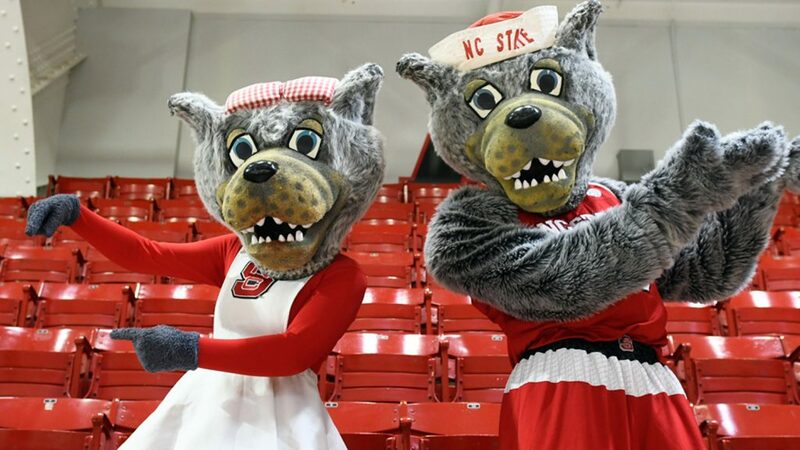 Roy and Dorothy Park, in their immense foresight and generosity, established the Park Foundation that has not only led to the academic enrichment of hundreds of students at NC State, but positive impacts in the arenas of media, animal rights, and sustainability. For the past nine years of my life, Roy and Dorothy have served as a source of inspiration and an example that a worthy life is one where one gives themselves wholly to the causes that they care about – the concerns in our society that they have the desire and the power to address. Thank you for the learning community, the Park Scholarship program, that you fostered at NC State. For it is a community of friends, mentors, educators. Those relationships endure time, those experiences plant the seeds of new shoots that will likewise grow and spread seed. Roy and Dorothy, you are a part of each of us, a story we will continue to tell. Our gratitude for your support and your life’s work will be always. Mrs. Park and the Park family have given incredibly to NCSU. Your investment in our students is truly world changing. I am so glad I have had the privilege been able to become part of your legacy as a Park faculty scholar. Thank you. Godspeed to your family as you grieve the passing of your mother, but celebrate her transformative life. It saddens me to hear of Mrs. Park’s passing. I am so grateful to the Park family for their dedication in believing that together we can make a difference to nature conservancy, social justice, or in technological advancements. Thank you to Mr. and Mrs. Park for committing to a life of service, it’s inspiration for us all. Dorothy and Roy Park have established a wonderful legacy with the Park Scholars Program. It has been a privilege to teach and work with a number of Park Scholars over my nine years at NC State. Every interaction with these Scholars has impressed me. They are friendly, inquisitive, energetic, and very, very smart. 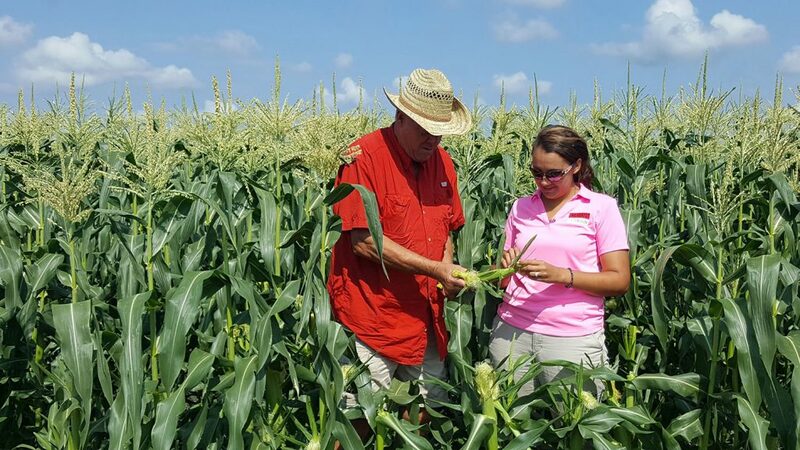 In short, they are ideal students, both in the classroom and in the research lab. I look forward to getting more involved in the Park Scholars Program and continuing to work with the amazing students the Programs recruits and develops. My deepest sympathies go out to Mrs. Park’s family! I hope they are aware of the huge impact they have made on NC State and the Park Scholar program. I will be forever grateful for the generosity of the Park Foundation and will constantly strive to embody the pillars of the program (scholarship, leadership, service, and character) in my life. What a wonderful legacy Mrs. Park and the Park family have left for generations of NC State students and the Wolfpack Nation. May she rest in peace and may her family be comforted by the love of the Lord. I am forever grateful to the Park family for their generous gift. Mrs. Park’s involvement in the program ensured its integrity and sustained success. The Park Scholarship program changed my life and helped put me on the path I am following today. I am sad to hear the news of her passing and will be thinking of her family during this time. I’d like to thank Mrs. Dorothy Park, the entire Park family, and the Park Foundation for supporting the NC State Park Scholarships for all these years. Much of my wonderful experience at NC State was due to the amazing people I met through the Park Scholarship program.